Relax in the comfort of 100% genuine leather in the seating areas with this contemporary leather match chair and on the top of the ottoman. Generous padding in the pillow top arms and bustle back with headrest support will keep you and your guests comfortable. 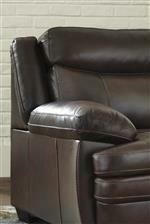 Matching faux leather on the sides and back keep the price of this piece affordable. The Hannalore Contemporary Leather Match Chair & Ottoman by Signature Design by Ashley at Walker's Furniture in the Spokane, Kennewick, Tri-Cities, Wenatchee, Coeur D’Alene, Yakima, Walla Walla, Umatilla, Moses Lake area. Product availability may vary. Contact us for the most current availability on this product. 1530420 Chair 1 43" 41" 39"
1530414 Ottoman 1 41" 24" 24"
Enjoy the feel of 100% leather in a versatile brown tone in the seating areas of items available from this living room furniture collection. Matching vinyl covers the back and sides to keep costs down. Jumbo accent stitching adds to the style of the comfortable and contemporary pieces. The Hannalore collection is a great option if you are looking for Contemporary furniture in the Spokane, Kennewick, Tri-Cities, Wenatchee, Coeur D’Alene, Yakima, Walla Walla, Umatilla, Moses Lake area. Browse other items in the Hannalore collection from Walker's Furniture in the Spokane, Kennewick, Tri-Cities, Wenatchee, Coeur D’Alene, Yakima, Walla Walla, Umatilla, Moses Lake area.